BitTorrent is a peer-to-peer file sharing protocol used to distribute large amounts of data. BitTorrent is one of the most common protocols for transferring large files, and by some estimates it accounts for about 35% of all traffic on the entire Internet. The initial distributor of the complete file or collection acts as the first seed. Each peer who downloads the data also uploads it to other peers, even after they have dismounted the original seed. Because of this, BitTorrent is extremely efficient. One seed is needed to begin spreading files between many users (peers). The addition of more seeds increases the likelihood of a successful connection exponentially. Now that you have learned a little about BitTorrent, let’s get down to business. The first thing that you have to do is download a BitTorrent client. If you are using Linux, there are tons of free and open source BitTorrent clients to choose from. And, if you are using the latest versions of popular distributions like Fedora or Ubuntu, a BitTorrent client is already included out-of-the-box. For this tutorial, let’s use Transmission on Ubuntu. Now that you have a BitTorrent client, it’s time to get a ‘.torrent’ file. 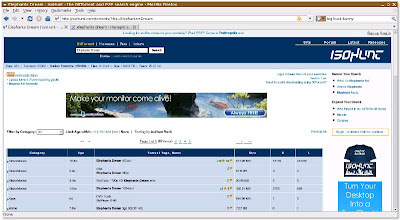 We can use popular BitTorrent search engines (a.k.a. tracker) like isoHunt to get what we want. 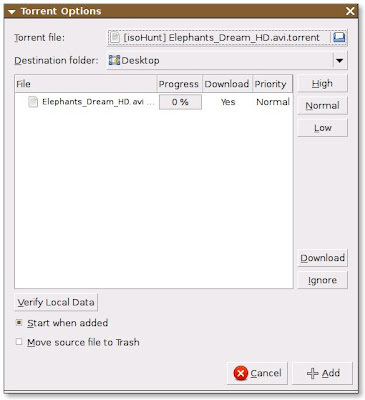 As an example, let’s go to isoHunt and download the free and open source short movie Elephants Dream. Note: We do not encourage downloading copyrighted materials. Suppose you like to get the first search result, just click on it to go to its download page. Click on 'Download .torrent' then open it with Transmission. The more peers or seeders you have, the faster the download. If the download is interrupted, it can be resumed anytime. I guess those are the basics to get you started downloading files via BitTorrent. What about "It's totally widespread, so everyone knows how to use it => noone uses google to find out"? I wrote "extremely" and not "totally"
But what if I just want to use a server with no GUI installed to download a .torrent? How do I do this? maybe you can help me? Since The Pirate Bay has been shut down on the 24th, my downloads stopped and they didn't restart although the Bay is online again. I read that restarting Transmission would help, but I don't know how to do that. Any remarks? Well... Mrs/Mr Anonymous, you might consider visiting www.openbittorrent.com, www.publicbt.com, or the "hidden tracker", z6gw6skubmo2pj43.tor2web.com since TPB has the stain of piracy in the eyes of the law. Additionally, www.btreannouncer.com and www.torrenteditor.com can be quite useful. Have fun and remember to compensate content creators in *some* monetary fashion! !